It is my privilege to introduce the SALE of Glenn Klein’s personal faceted gem collection. You will have an opportunity to purchase your very own piece of USFG history, at very reasonable prices. 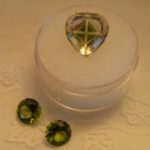 Glenn and Rhoda Klein have authorized the sale of Glenn’s original faceted gems, along with the USFG acquisition of his “Historical Museum Gem Collection”. This will include a museum collection fundraising effort, on behalf of the Kleins. As a USFG member, you will be receiving an authorized e-mail, introducing this effort and a detailed list of the Gem Lots offered in this sale. Also, look for an upcoming news release about this sale on the USFG website News section. If you wish to be among the first collectors to consider this very limited opportunity, contact me by e-mail. I will send you the Collection Prospectus for your preview and consideration. There are a total of 27 Lots of gems for sale, and they are already selling fast. If you wish to donate to the Klein Museum Collection Fund, contact me as well for details. Don’t hesitate! Please share this with everyone! A link to the List of gem lots is now available in the “News” section. Lot details and photos are available there.